On February 3 1965, Minister for Housing Richard Crossman announced that Northampton was to be one the new towns offering housing to people living in poor conditions in London. Northampton Development Corporation (NDC) marketed the town to people in over-crowded London and Birmingham. Established in 1968, Northampton Development Corporation spent £205m building new housing estates. In 1971, Northampton was home to 130,000 people; by 2012 the census recorded around 212,000 Northamptonians. To keep up with demands of the growing population, the town under-went a transformation. Out went pokey back-to-back streets, factory yards and muddled areas and in came super-modern new shopping centres, new estates, tower blocks and a programme of road widening. 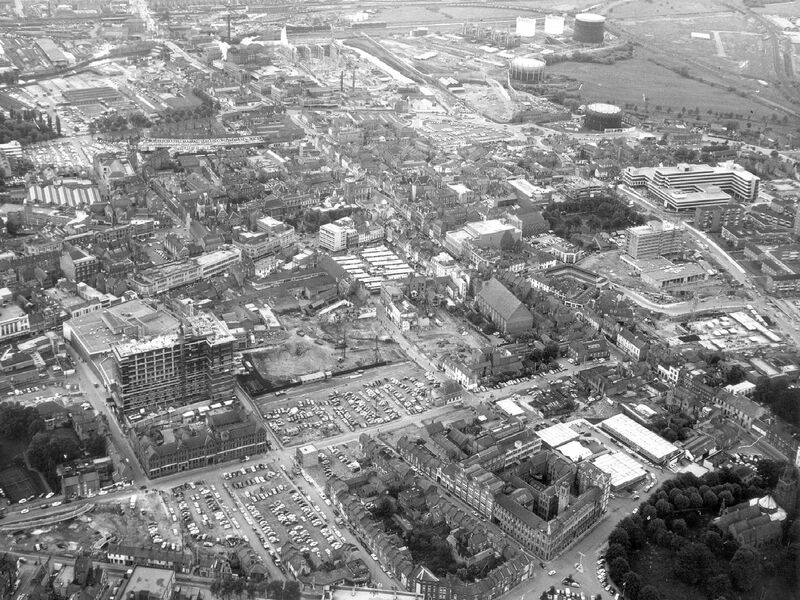 This aerial photograph of Northampton, taken in around 1972, reveals the extent of demolition that had taken place in the heart of the town leaving large swathes of car parking space: Ladys Lane runs from left to right (west to east). 'In the far right hand corner is The Church of the Holy Sepulchre, surrounded by trees: top middle is the modern Carlsberg Brewery. Part of the land which is know as Rat Island, in 1971 Park St was a typical Victorian terraced street complete with corner shops - Chipperfield's General Store and at its end the distinctive Allied Leather Distributors in what is now known as Ladys Lane but then, Mount Street.